The Rocketman concept is fronted by a hexagonal-shaped grille and oval headlamps with the latest LED technology. Its design cues may appear on the next Mini. Mini is returning to its roots with an ultra-compact concept called the Rocketman that will debut at the Geneva auto show next month ahead of likely future production. The car has been conceived as a modern interpretation of the original Alec Issigonis-inspired model that revolutionized small car design when it was introduced in 1959. The concept is clear recognition that Mini is considering a cheaper, urban-based model to compete with the Smart ForTwo. While stopping short of confirming the Rocketman will be developed into a showroom model, Mini is keen to point out that every concept it has created since the brand was re-launched by BMW in 2001 has progressed into production. Styled in-house by the same team responsible for the recent Beachcomber and Paceman concepts, the Rocketman does not have the contemporary one-box styling of rivals such as the ForTwo. Instead it has a more traditional two-box profile that provides it with unmistakable visual ties to the rest of the Mini line-up. The new concept also has a fresh take on some classic Mini design cues -- many of which are will be on the next regular Mini due in 2013. The Rocketman also gets tauter surfacing treatment than any existing Mini model. The result is a modern-looking small car whose design is not conspicuously retro. It's fronted by a hexagonal-shaped grille, oval headlamps with the latest LED technology, an upright windscreen heavily tapered at the outer edges, a high waistline and large wheelhouses accommodating 18-inch wheels shod with narrow, low-rolling resistance tires from Continental. 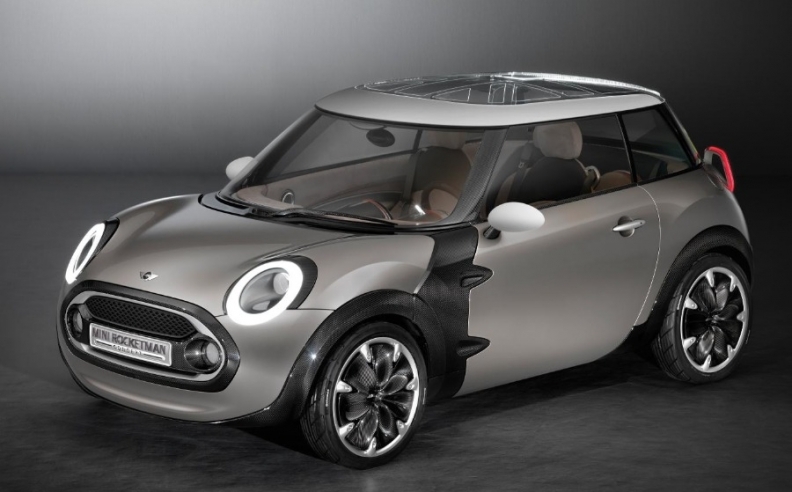 The design team has also provided the concept with a re-interpretation of the original Mini's so-called floating roof. The glass structure is arranged in sections that are fitted with with optical fibers to recreate the look of the Union Jack. When not illuminated in the colors of the British flag, the various sections glow a neutral white. Curiously for a Mini, there is a distinct lack of chrome adorning the Rocketman's exterior. Instead, it receives carbon-fiber reinforced plastic highlights, most prominently within the front fenders and wheelarches, to further enforce its contemporary construction. 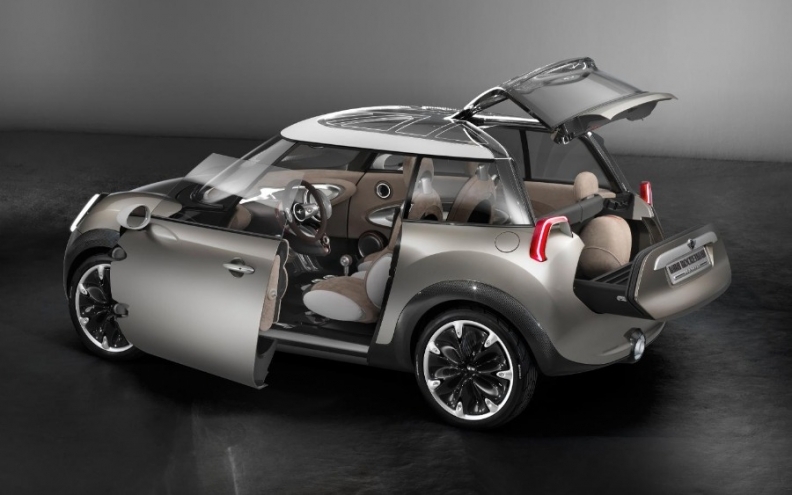 To ease entry to the cabin, Mini's designers used deep, double-hinged frameless doors. They pivot outwards in a two-stage process that provides a larger opening angle than a conventional single hinged door when space is at a premium. The lower edge of the doors also incorporate the sill element-- something made possible by the concept's carbon-fiber space frame design--but likely to be ruled out on costs grounds for any eventual production version of the new car. Mini hasn't officially confirmed what engine it plans for a possible production version. But it's no secret, BMW is already well advanced on a new range of turbocharged three-cylinder common rail diesel and direct-injection gasoline units. Codenamed N37 and N38, they share the same architecture of the German car maker's in-line four- and six-cylinder diesel and gasoline engines. Another question mark hangs over exactly what platform Mini is looking towards to base its new entry level model. While BMW is developing a new front-wheel drive structure to underpin the next-generation hardtop, Mini officials suggest it will be too big to provide a suitable platform for a car of such compact dimensions as the Rocketman. One possible scenario put to AutoWeek during a exclusive preview of the new concept is the development of a smaller structure with PSA (Peugeot-Citroen), with which BMW already collaborates in the area of four-cylinder diesel and gasoline engines. The Rocketman has double-hinged frameless doors that pivot outwards to make access easier. An equal amount of attention has also been paid to the luggage carrying properties of the Mini, which receives a innovative two-piece tailgate. The upper part, fashioned from glass, hinges centrally from within the roof, opening high to provide easy access to the trunk. By contrast, the lower part slides out from the bodywork in the form of a drawer that also doubles as a luggage carrier. The Rocketman is shorter, wider and lower than the hardtop. Mini hasn't officially confirmed what engine it plans for a possible production version. But owner BMW is already well advanced on a new range of turbocharged three-cylinder common rail diesel and direct-injection gasoline units. Codenamed N37 and N38, they share the same architecture of the German carmaker's in-line four- and six-cylinder diesel and gasoline engines. Another question mark hangs over exactly what platform Mini is looking towards to base its new entry level model. While BMW is developing a new front-wheel drive structure to underpin the next-generation hardtop, Mini officials suggest it will be too big to provide a suitable platform for a car of such compact dimensions as the Rocketman. One possible scenario put to AutoWeek during a exclusive preview of the new concept is the development of a smaller structure with PSA/Peugeot-Citroen, with which BMW already collaborates in the area of four-cylinder diesel and gasoline engines.